SIMON BUTLER admits he has resigned as manager of Arundel Football Club with a heavy heart. 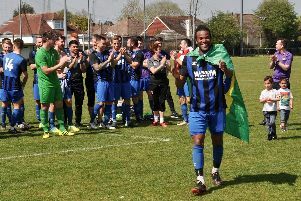 Butler has spent ten years at the club, as manager and assistant boss, and guided the club to the Peter Bentley Cup final last season, when they also reached the Sussex RUR Cup semi-finals. However, after a 4-0 defeat at Broadbridge Heath in the Southern Combination League Premier Division on Saturday, Butler felt it was the right time to step down. He said: “After ten enjoyable and some testing years at the club, I feel now is the right time for me to stand down after a couple of poor results and also a change in my current workload in my personal life. “Arundel FC has been a major part of my life, as my wife will testify to, so it’s with a heavy heart I’ve made this decision. Butler says he will still go to Mill Road to watch the club and said: “I pride myself on helping bring the club through some very hard times both on and off the pitch over the years I’ve been involved. “Arundel is a good, honest and well-run club and one I would recommend to anyone to be a part of. “What we’ve achieved in the way of having a first, reserve and youth teams, all competing at a good standard on a zero budget is nothing but amazing. It proves that we must have done something right over the years and that’s something that I will treasure always. “I want to say thank-you to everyone at the club for their support over the years - Bob, the committee, the players, the supporters and everyone behind the scenes. Barry Pidgeon and Craig Stuart will take charge of tonight’s Sussex RUR Cup tie at Crowborough.